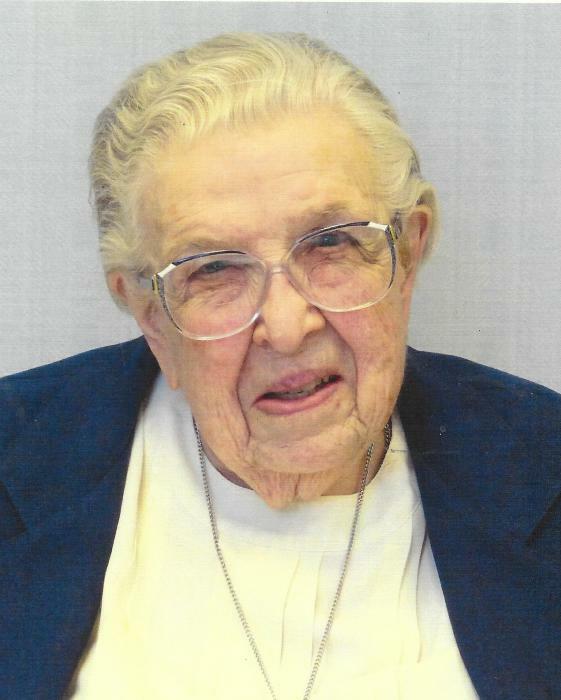 Obituary for Sister Catherine Lash, C.S.C. (Sister M. Assumpta) | Kaniewski Funeral Homes, Inc. I was born on October 9, 1919 to Kathleen Hasson and Joseph Lash in Alexandria, Virginia, the oldest of five children. Holy Cross Sisters were my teachers through grade and high school at Saint Mary’s Academy, Alexandria, Virginia. After entering Holy Cross in 1938, I did my college work at Incarnate Word College, San Antonio, Texas during many summer sessions where I earned my Bachelor of Music Education in 1954. I taught music in high schools and worked with all grades of students in glee clubs most of my community life in Texas, Washington, DC, Pennsylvania and Virginia. For 17 years, in addition to teaching, I was treasurer at Saint Mary’s Academy, Alexandria, Virginia until 1975. Next, I was Eastern Regional Treasurer for six years; then was the accountant and teacher at St. Patrick’s Academy, Washington, DC from 1981-1984; and then superior for the next six years at our retirement home at Saint Angela Hall, Kensington, Maryland. In Fall 1990 I returned to Saint Mary’s, Notre Dame, Indiana, our motherhouse, and am working for Holy Cross Services in the accounting department. I often recall the many wonderful sisters in Holy Cross with whom I have shared fifty-plus years of living, praying, learning, teaching, and working. Sister Catherine served in Holy Cross Services for 23 Septembers. She retired to Saint Mary’s Convent, Notre Dame, Indiana at the end of 2012, transferring to full-time ministry of prayer. Sister died at 99 years old, having lived in community with other Holy Cross women for 80 years. She loved her “numbers,” long before the era of computerized bookkeeping. The sisters were glad to have had her do house, school and regional accounts. Those who lived with her, remember Sister Catherine as patient, kind, gentle, generous and extraordinarily compassionate. She was a calming spirit, easy to talk to, and friendly. Her friends drew her out from her natural introversion. An office desk in a back room was a welcome altar upon which to lay daily bread and sanctify one’s soul. She also made a daily holy hour in Augusta Hall Chapel where the quiet and peace renewed her spiritually. Sister Catherine Lash was comforted by traditional prayers the sisters prayed with her in her last hours, “You know, Lord, my weakness…. If I sink, look on me and raise me up. By your own holy cross and passion, sanctify my cross and keep me your own forever. Amen.” On the evening of the Feast of All Souls, when Catholics remember their bonds with the souls of all the faithfully departed, the God of mercy and compassion looked on her and raised her up.